You step forth from a blood soaked battlefield. The snow crunches beneath you, your ragged breath visible before you. Everyone is dead save a few curious villagers who have come out to strip the fallen of any valuables. You’re family, dead. You’re mates, dead. You’re company captain, dead. Well shite, you are in a bad way. Its to be expected though, you are a mercenary. Now you have a few options stick around and look for work in the village nearby or head back east. You heard of a Mercenary company looking for recruits. As you begin to things over, a villager screams. You turn to see the source of the outburst as a headless chain mailed corpse starts to rise up, followed by several other slain warriors. Looks like you’re headed east after all. In the year 1220 of our Lord and Savior Mi'tilarro, the Helmlein Empire launched an aggressive campaign to subdue the kingdom of Midland and to cleanse the land all the worshippers of Mi’tilarro. While in the early stages of the war imperial troops made significant gains, the deeper they pushed into Midland the more staunch the resistance became. Fever pitched battles began over strategically insignificant towns and villages, and by the winter of 1235 the war had reached a standstill. A temporary armistice has been called as peace negotiations begin. Daemon’s Bane (merc) – man, woman, elf or dwarf suits the company just fine, however other humans may not be as receptive of you. The company is made up of warriors from all walks of life, and backgrounds. Its part of what makes them so effective. Imperial Inquisition – Zealots followers of the god-emperor the Inquisition are the religious paramilitary group within the Imperial armies. They root out all non humans and believers of Mi'tilarro. They also act as elite bodyguards for the Imperial Family when so needed. 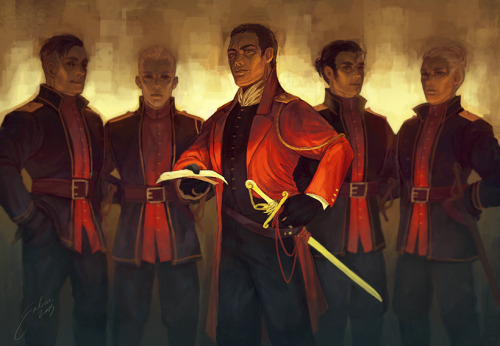 Looks like you've got an awesome roleplay started, Emperor Tiberiu!! If you would like to advertise for more members, here are some ways to do so! Hi there, I'm interested in joining, but I have a question. What do the Daemon's Bane do? Or more specifically, what will they be doing in the RP? Is this some sort of low fantasy zombie apocalypse kind of story? Or will it be a DnD-like questline?